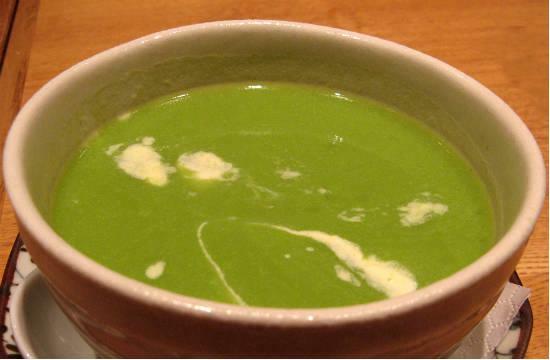 A delicious soup with green peas and white sauce. 1. Boil peas with minced onion, mint, dried herbs and salt. 2. Cool, pass through a liquidiser and set aside the puree. 3. To prepare the white sauce, melt butter, add flour and fry till it turns to a light pink. 4. Add milk gradually, stirring all the while so that no lumps are formed. 5. Add pepper and curry powder. 6. Gradually, add peas puree to white sauce adding some milk if too thick. 7. Add some salt, if necessary. 8. Keep soup hot till serving time. 9. To serve, beat cream smooth. 10. Pour hot soup into bowl, add a swirl of cream to each bowl and garnish with a pinch of chopped mint. Feel free to comment or share your thoughts on this Green Peas Soup Recipe from Awesome Cuisine.